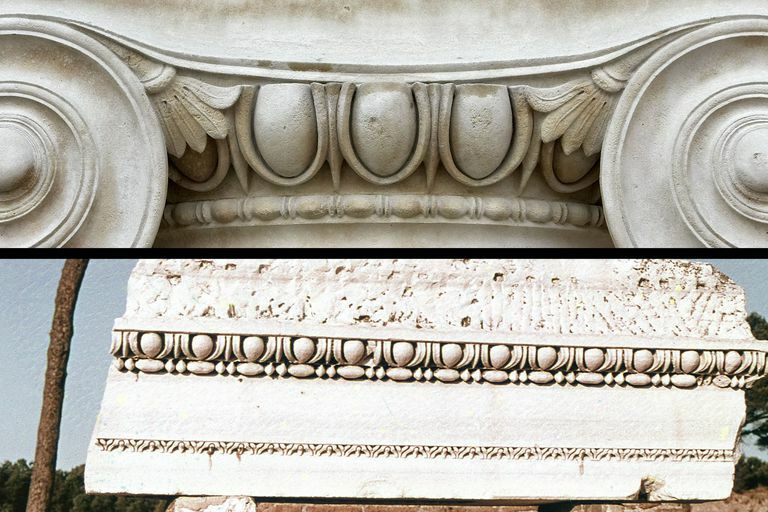 Egg-and-dart patterns on an Ionic column (top) and a piece of ancient cornice (bottom). Egg-and-dart is a repetitive design that today is most often found on molding (e.g., crown molding) or trim. The pattern is characterized by a repetition of oval shapes, like an egg split lengthwise, with various non-curved patterns, like "darts," repeated between the egg pattern. In three-dimensional sculpting of wood or stone, the pattern is in bas-relief, but the pattern can also be found in two-dimensional painting and stencil. The curved and non-curved pattern has been pleasing to the eye for centuries. It is often found in ancient Greek and Roman architecture and, so, is considered a Classical design element. Because its origins are from ancient Greece and Rome, the egg-and-dart motif is most often found in Neoclassical architecture, both public and residential, on interiors and exteriors. The Classical design provides a regal and stately feel to a room or facade. The above photos illustrate the common ornamentation use of egg-and-dart design. The top photo is a detail of an Ionic column of the Great Court at the British Museum in London, England. This column's capital shows the volutes or scrolls typical of Ionic columns. Although the scrolls are a defining characteristic of the Ionic Classical Order, the egg-and-dart between them are added details—architectural ornamentation more ornate than found on many earlier Greek structures. The bottom photo is a piece of cornice from the Roman Forum in Italy. The egg-and-dart design, which would run horizontally along the top of the ancient structure, is underscored by another design called bead and reel. Look carefully at the Ionic column in the picture above, and you'll notice the same bead-and-reel design beneath that egg-and-dart. In the egg-and-dart design on the ancient Parthenon in Athens, Greece combines both of these uses—between volutes and continuous design line on the entablature. Other Roman-inspired examples include the Temple of Saturnus at the Roman Forum in Italy and the Temple of Baal in Palmyra, Syria. Ovolo molding is another name for quarter round molding. It comes from the Latin word for egg, ovum, and is sometimes used to describe crown molding decorated with an egg-and-dart motif. Ensure that you understand the meaning of "ovolo" as used by your architect or contractor because today's ovolo molding does not necessarily mean its decoration is egg-and-dart. So, what is ovolo? 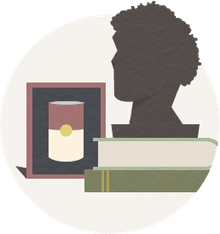 What Is Echinus and Astragal? This design looks very similar to egg-and-dart with a bead and reel below. The word "echinus," however, is architecturally part of a Doric column and the word "astragal" describes a bead design more simple than bead and reel. Today, "echinus and astragal" is used by historians and students of Classical architecture—rarely by homeowners. Baker, John Milnes, and W.W. Norton, American House Styles: a Concise Guide. 1994, p. 170. Harris, Cyril M. Dictionary of Architecture & Construction. McGraw-Hill, 2006. pp. 176, 177, 344.